Customize these business cards with your library name, NebraskAccess password and the date the password expires. Print on regular paper and cut apart or print on special perforated business card cardstock (produced by companies like Avery and available through office supply stores or online). Distribute to patrons so they can keep your NebraskAccess password handy. There are multiple programs that will open and display PDF documents however not all of them support the filling in of form fields. If you are unable to use the following steps to add information please see the Customizable PDF Documents for more information. Click your left mouse button to position your cursor immediately below the "Recommended for your online information needs by" line. Type your library name. It should appear beneath the "Recommended for . . ." line. Copying and pasting information into the PDF document may cause problems! Press your Tab key. This causes your library name to be reproduced in the same location on the remaining nine business cards. It also moves your cursor to the next field, immediately to the right of the "Password" label. 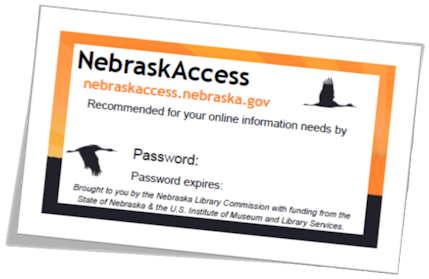 Type your library's NebraskAccess password. It should appear to the right of the "Password" label. Copying and pasting information into the PDF document may cause problems! Press your Tab key again to update the remaining cards and move your cursor to the next field, immediately to the right of the "Password expires:" label. Type the date when this NebraskAccess password will expire. Press your Tab key to update the remaining nine business cards with your password.